Miles Edward O'Brien is a character in the fictional Star Trek franchise. He appears sporadically in all seven seasons of Star Trek: The Next Generation and is a main cast member of Star Trek: Deep Space Nine. O'Brien was originally the transporter chief of the USS Enterprise-D. He was later promoted to Chief of Operations of Deep Space Nine. 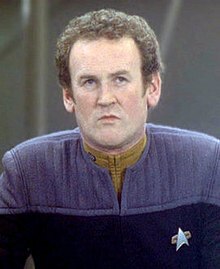 O'Brien is the only major Star Trek character described as both ethnically Irish and born in Ireland. O'Brien is portrayed by actor Colm Meaney. According to Colm Meaney, at first O'Brien "was just there, not really established as a character, and that went on for a bit." He can be seen as the battle bridge's conn operator in the first TNG episode, "Encounter at Farpoint." Appearing on and off in more TNG episodes, it wasn't until the second season episode "Unnatural Selection" that Meaney's character was actually named, and the second episode of season 4, "Family," before the character was finally given a first name. However, Meaney came to like the arrangement of being hired on an episode-by-episode basis, and was hesitant to sign on as a regular on DS9. Along with Worf, Miles O'Brien is one of the two characters that moved from TNG to be a main character on DS9. They are reunited in "The Way of the Warrior" and O'Brien meets him as he comes in from the DS9 docking port airlock; later they are able to reminisce at Quark's casino on their shared time aboard the Enterprise-D. The backstory of the character states that Miles O'Brien was born in Killarney, a town in County Kerry in Ireland, Earth, in September 2328. He claims descent from Brian Boru, the famous Ard Rí, or High King of Ireland (and founder of the O'Brien Clan). His father, Michael O'Brien, wanted him to play the cello, so he pursued this and was eventually accepted into the Aldebaran Music Academy (revealed in DS9 episode "Shadowplay"). However, a few days before he was scheduled to start classes there, he enlisted in Starfleet. O'Brien can also be seen playing the cello as part of Data's string quartet early in the TNG episode "The Ensigns of Command". In the DS9 episode "Invasive Procedures", it is revealed he has two brothers. The TNG episode "The Wounded" establishes that O'Brien served as tactical officer aboard the USS Rutledge during the Cardassian War and that he was emotionally scarred by the Cardassians' massacre of hundreds of civilians on Setlik III. O'Brien does not remember how many Cardassians he killed, because he killed so many (Star Trek DS9: "The Inquisition"). In that episode, it is clear that the classic Irish tune "The Minstrel Boy" plays a major part of his journey as a character: an innocent man thrown into the destructive nature of war. He sings the song in this episode, and much later, in the final episode of DS9 "What You Leave Behind". "The Minstrel Boy" is the first musical theme to be heard in the flashback sequence. In the DS9 episode "Bar Association", O'Brien jokingly claims to be a direct descendant of real-life Irish High King Brian Boru (according to Irish tradition, all people with the surname "O'Brien" are descendants thereof). Later, he speaks more seriously of fictional ancestor Sean Aloysius O'Brien, a major player in one of the first United States workers' unions, who participated in the Coal Strike of 1902 in Pennsylvania and was shot, then dumped into the Allegheny River. In the episode "Rules of Engagement", it is revealed that during O'Brien's 22 years in Starfleet, he had fought in 235 separate battles and had been decorated by Starfleet on 15 occasions, and was considered to be an expert in starship combat. O'Brien's first appearance in Star Trek: The Next Generation as the battle bridge flight controller in The Next Generation premiere episode "Encounter at Farpoint", with his only other appearance in the first season being as a security guard in the episode "Lonely Among Us". Starting with the second season premiere, "The Child", O'Brien began his regular role as the ship's transporter operator, a position which had usually been filled by the since-departed Tasha Yar in the first season. In the following episode, "Where Silence Has Lease", when Riker and Worf prepare to beam to the USS Yamato, Riker refers to him as a lieutenant and the character is wearing lieutenant collar pips. He still wears lieutenant pips in "Sarek", but in later episodes, the collar symbol has changed and O'Brien is referred to simply as Chief. (See "Rank" below). In 2367, he confronted Capt. Benjamin Maxwell, his former commanding officer on the USS Rutledge, when Maxwell attacked Cardassian ships and outposts without authorisation and threatened the peace between the Federation and the Cardassian Union (TNG: "The Wounded"). During the Klingon Civil War, O'Brien is assigned to the bridge as tactical officer due to Worf's resignation from Starfleet and the temporary reassignment of officers to other ships in a fleet led by Capt. Picard (TNG: "Redemption Part II"). O'Brien marries Keiko Ishikawa aboard the USS Enterprise-D in the TNG episode "Data's Day". They have a daughter, Molly, who is delivered by Worf in "Disaster". 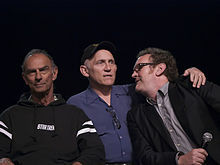 Colm Meaney (right) with Deep Space 9 co-stars Marc Alaimo (left) and Armin Shimerman (center), who portrayed the characters of Gul Dukat and Quark, respectively. The character of Miles O'Brien was transplanted from TNG to DS9 at the beginning of the latter show. In the story, Miles O'Brien transfers from the Enterprise-D to Deep Space Nine in the DS9 premiere episode "Emissary", to serve as the station's chief of operations. O'Brien's character is unique in the Star Trek universe. As well as being a non-commissioned officer, he is also a family man with a wife and children. He is often portrayed as being less patrician, and more pragmatic and down-to-earth than his colleagues. The producers would routinely put O'Brien under intense psychological pressure in episodes jokingly dubbed 'O'Brien must suffer'. O'Brien was regularly chosen for such storylines because it was felt people could empathise with him. With the help of Jadzia Dax, he devised a way of moving the station from orbit around Bajor to the site of the newly discovered wormhole, allowing Bajor to take possession. He would later assume an additional role as chief engineer of the USS Defiant, which is assigned to Deep Space Nine in the episode "The Search". While at DS9, he meets Dr. Julian Bashir, who initially irritates O'Brien (Episode: "The Storyteller"), but the two characters eventually become best friends. In particular, they frequently play darts and fight historical battles in the holosuites. Miles was reprimanded for violating the Prime Directive when he helped an alien from the Gamma Quadrant, referred to as "Tosk", escape from other aliens who had been hunting him in "Captive Pursuit". In 2370, he is arrested by the Cardassians and charged with supplying weapons to the Maquis. The charges were dismissed when it was revealed to be part of a conspiracy to discredit the Federation (Episode: "Tribunal"). After an accident aboard the station in 2371, O'Brien was temporarily shifted forward in time by a few hours. He died when he deliberately contaminated himself to determine what caused the events he had witnessed. He sent his future counterpart back in his place (Episode: "Visionary"). Miles was temporarily relieved of duty after a visit to the planet Argratha. O'Brien had been falsely accused of espionage and was given the simulated memory of a 20-year prison sentence. O'Brien became paranoid and emotionally distressed upon his return to the station and attempted suicide (Episode: "Hard Time"). In 2373, he has a son, Kirayoshi, delivered by surrogate Kira Nerys in the episode "The Begotten". At the end of Deep Space Nine, O'Brien and his family depart the station to move back to Earth, where Miles is to serve as an engineering professor at Starfleet Academy. The soundtrack accompanying these moments on screen is to the tune of "The Minstrel Boy". DS9, in particular, makes mention and the use of Miles' many years of experience in Starfleet as a device to allow the character to play a major part in various storylines and as further justification for his holding what is, essentially, a command-level position while still being a non-commissioned officer. Indeed, Miles has as much as, if not more, command experience than those officers he works with. For instance, during a formal extradition hearing regarding Lt. Commander Worf, O'Brien is declared an expert in starship combat owing to his experiences and is asked to critique Worf's actions. Also, Miles offered Worf some guidance about commanding and managing others during a crisis. Miles' style of command can be classified as generally hands-on with an emphasis on "thinking on your feet" when solving problems. However, Miles is not above asserting his authority when required. All that said, Miles uses a straightforward and common-sense approach toward the issues he faces. Miles O'Brien of the Mirror Universe was a Terran slave who worked for the Klingon-Cardassian Alliance aboard station Terok Nor. In 2370, O'Brien was working in the station's ore processing center. O'Brien was also occasionally recruited to repair Benjamin Sisko's raider when it was docked at the station. Sisko claimed he hated the name Miles, and instead nicknamed O'Brien "Smiley". Miles was known on the station for being an excellent "tinkerer and putterer". When Smiley met a Julian Bashir from another universe in the ore processing center, he initially thought that Bashir's "wild" tales of his counterpart being Chief of Operations was simply a ruse to get him to help Bashir. However, Bashir was able to persuade him to help after he realised that anything had to be better than being a slave. Smiley agreed to help Bashir try to escape from the station only if he could go back with him to the other universe. When Captain Sisko defied Intendant Kira Nerys who commanded the station, Smiley changed his mind and decided to join Sisko's crew, deciding that there was something worth staying for after all (Episode: "Crossover"). When Mirror Sisko was killed by the Alliance in early 2371, Smiley took charge of the Terran Rebellion. To complete Sisko's last mission, he recruited Benjamin Sisko to take the place of his deceased counterpart long enough to convince Jennifer Sisko to leave the Alliance and start working for the Rebellion (Episode: "Through the Looking Glass"). While he was aboard Deep Space 9, Smiley took the opportunity to download a large portion of the station's database, including the schematics for the USS Defiant. Smiley used the stolen specifications to build a warship, which they named Defiant. After the rebels managed to capture Terok Nor from the Alliance, the Alliance prepared to recapture the station. Smiley once again recruited Sisko to help them finish construction of the Defiant in time. After successfully defending the station, Smiley sent Sisko back home (Episode: "Shattered Mirror"). In 2375, Smiley was in command of the Defiant when it pursued Brunt's ship as it stole a cloaking device from the station, and later negotiated Regent Worf's surrender and capture (Episode: "The Emperor's New Cloak"). During the story progression of TNG and DS9, O'Brien wears black silver-rimmed insignia, or lieutenant junior grade (TNG: "Encounter at Farpoint"), lieutenant insignia ("Redemption, Part II", "Data's Day", etc. ), and then black gold-rimmed insignia (DS9: "Emissary"). Sergey Rozhenko calls him a Chief Petty Officer in "Family" (TNG) but he had been referred to in previous episodes as Lieutenant. Eventually, O'Brien receives a distinct senior chief petty officer's insignia and his rank is emphatically identified in "Hippocratic Oath" (DS9). In 2016, ScreenRant rated Miles O'Brien as the 20th best character in Star Trek overall as presented in television and film up to that time, highlighting the character's role in episodes such as “Hard Time,” “Tribunal,” “The Wounded,” and “Time’s Orphan”.